Sue Jeffrey submitted this photo and caption. 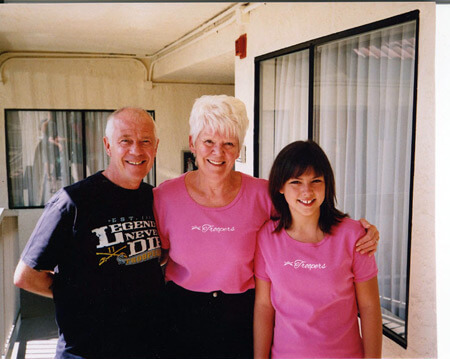 DCI fans from England; John Walkey whose son Nathan marched as a member of the Santa Clara Vanguard, Judith Fear, and her granddaughter Ellie Brownlee, show support for one of their favorite corps during their visit to the DCI World Championships in 2007. Ellie along with her sister Mollie marched as members of the Blue Devils C corps during the 2008 season. Ellie was honored with the corps' Rookie of the Year award. Just like they did in 2007, a group of about 10 people is planning another big trip across the pond to the "colonies" in 2010.